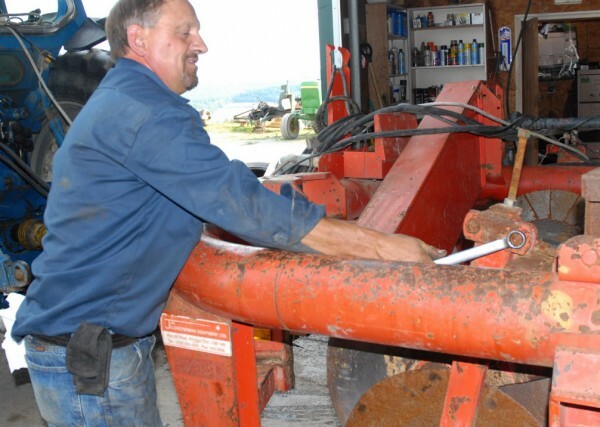 John Roy of Fort Kent works on his potato harvester in preparation for the start of the 2012 harvest season. Like farmers around Aroostook County, Roy said he's seeing excellent quality in the potatoes but much smaller tuber sizes. "I'll say we're going to see 50 barrels less an acre on average from last year," Roy said. FORT KENT, Maine — For generations in northern Maine the annual potato harvest break has been as much a part of the start of a new school year as books, back-to-school clothes and locker combinations. And while the number of active farms in Aroostook County has shrunk and districts have adapted to changing agriculture demographics, in the coming weeks students from Mars HIll to Madawaska will put classes on hold as the harvest begins. This year SAD 33 is joining AOS 95/SAD 27 in Fort Kent and the Madawaska School Department in delaying the annual break by one week and will be on recess Sept. 24 to Oct. 9. The change in schedule meant coordinating with schools in Madawaska and Fort Kent, Desjardins said, since all three departments share the calendar year with the St. John Valley Technical Center. In Fort Kent, Superintendent Tim Doak said his board was happy to comply. Administrators in all three districts surveyed the farmers within their respective areas and said the request for the one-week delay was unanimous. The dozen active farms within SAD 33 directly employ 34 percent of the students, Desjardins said, with another 37 percent working jobs indirectly related to the harvest, such as child care or food preparation. In AOS 95, according to Doak, 18 percent to 20 percent of the students are directly involved in the harvest working for seven farming operations, and in Madawaska about a quarter of the high school students find work with area farmers. Elsewhere in Aroostook County, the harvest break is on schedule from Presque Isle and Mars Hill, which released students Friday through Oct. 10, to Fort Fairfield, where students will be off from Sept. 28 to Oct. 10. Also taking part in the annual harvest recess are school districts in Easton, Van Buren and Caribou. For the first year Houlton is not having a harvest recess, having voted to do away with the tradition last year. Only in the St. John Valley is the unseasonably dry summer having an impact on the harvest schedule, despite the fact the weather is affecting crops countywide. “The weather and rain — or lack of it — was quite variable from one end of [Aroostook] County to the other this year,” said Tim Hobbs, director of development and grower relations with the Maine Potato Board. Early season potato varieties such as the Shepody and Superiors may experience smaller yields due to smaller size thanks to that lack of rainfall, Hobbs said, adding farmers are reluctant to wait too long to harvest those varieties due to demand. This will translate into smaller tubers, Hobbs said, but he is anticipating a very high-quality crop this year. In addition, farmers are not facing the potential spoilage problems with stored potatoes they saw last year because of the unusually rainy summer and harvest season. Meanwhile, things seem to be on track for later varieties such as the Russet Burbanks, Hobbs said. The farmers he said, appreciate the harvest break and the student workers it provides to get those crops out of the fields. Adapting to the harvest conditions is just common sense, Desjardins said. “If we are going to release the kids to work the harvest, it makes sense to release them when the farmers are harvesting,” she said. In SAD 1, Superintendent Dr. Gehrig Johnson said the three-week break is a tradition to which the district is committed. Presque Isle High School contributes about 125 student workers to the annual harvest, about 20 percent of the student body, the superintendent said. “As long as the farmers tell us they need that workforce, we will cooperate,” Gehrig said. As for academics, Gehrig said the three-week break has little to no impact on learning given the fact Presque Isle High School consistently ranks high in school evaluation surveys in the state. For many students, Desjardins said, harvest break goes beyond academics. “These kids are earning money for expenses and developing a work ethic,” she said. Wayne Anderson, principal at Madawaska High School, agrees.